John Travolta was a huge star in the late 1970s, thanks to the success of TV’s Welcome Back, Kotter and the movies Carrie (1976), Saturday Night Fever (1977) and Grease (1978). His career since has been a marvel of highs and lows: Moment By Moment (1978) was a legendary bomb, but Urban Cowboy (1980) was a pop culture trend-setter; he bombed again in Blow Out (1981) and Perfect (1983), yet he was in the financially successful comedy series Look Who’s Talking (1989-93); he was hailed for a “comeback” and received an Oscar for his role in Quentin Tarantino’s Pulp Fiction (1994, co-starring Uma Thurman), but the critics famously held their noses for Battlefield Earth (2000). In spite of the lows, he is one of the highest paid actors in Hollywood and keeps making movies. He starred in Swordfish (2001, with Halle Berry and Hugh Jackman), Basic (2003, with Pulp Fiction co-star Samuel L. Jackson) and Be Cool (2005’s sequel to Get Shorty, co-starring Vince Vaughn), and in 2007 he had a memorable role as a Baltimore housewife in the musical film Hairspray (also starring Christopher Walken). 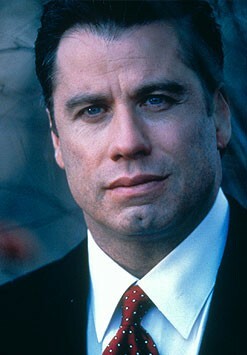 Travolta married the actress Kelly Preston in 1991. They had two children: Jett (b. 1992) and Ella Bleu (b. 2000). Jett Travolta died on 2 January 2009 after having a seizure during a family vacation in the Bahamas… John Travolta, like fellow superstar Tom Cruise, is a Scientologist… He has a pilot’s license and owns several aircraft.